Performers include: Lauren Graham, Alexis Bledel, Keiko Agena, Scott Patterson, Yanic Truesdale, Kelly Bishop, Edward Herrmann, Melissa McCarthy, Sean Gunn, Liza Weil, Liz Torres, Jared Padalecki, Matt Czuchry, Jackson Douglas, Michael Winters, Sally Struthers, Emily Kuroda, and Todd Lowe. A drama that follows unwed mother Lorelai Victoria Gilmore (Lauren Graham) as she raises her teenage daughter Lorelai “Rory” Leigh Gilmore (Alexis Bledel). Set in the small and quirky Connecticut town of Stars Hollow, the relationship drama is known for its trademark wit, quick repartee, and pop-culture references. Other characters include diner owner Luke Danes (Scott Patterson); Lorelai’s parents, Emily and Richard Gilmore (Kelly Bishop and Edward Herrmann); vegan Lane Kim (Keiko Agena); chef Sookie St. James (Melissa McCarthy); driven Paris Geller (Liza Weil); and style-conscious Michel Gerard (Yanic Truesdale). Watching this show on Netflix. I loved it the first time through, and now again. I am still waiting for a movie or the show to come back. Maybe Netflix can bring it back like Arrested Development. People need to realize that The CW in 2007 loved canceling shows after the season Finale’s were filmed and ready to air. Like Gilmore Girls, Veronica Mars and 7th Heaven(the first Finale), The CW gave no notice to the writer’s of the shows that the shows were not coming back. 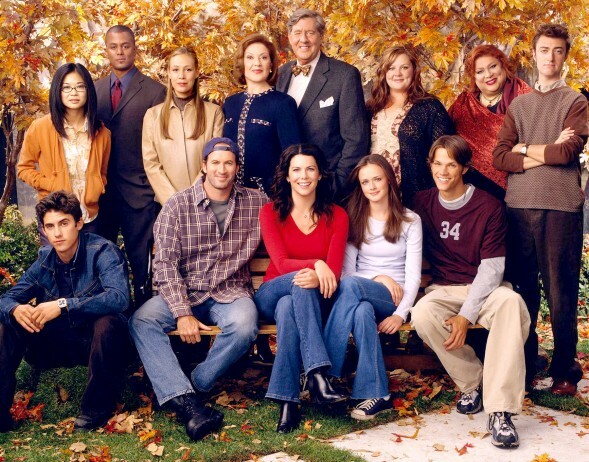 Now, Gilmore Girls people did luckily hear that it was cancelled before the finale premiered, so they were able to go back and edit the finale so that it was somewhat open-ended, but still wasn’t a real finale. I think that the Gilmore Girls series needs an ending that can leave the audience happy, why just end it without letting the veiwers know what happens???? I think that Luke and Lorelai need to Finally get married, possibly Lorelai involving Emily to show that she really does want her mums opinion, and what about Rory??? Does she really want to be with Logan after all? or will she marry Jess? Whether this be in the fom of a movie, or just one last season, either way, it is in desperate need of an ending that suits. I think that Rory will run into Jess and get together with him. And maybe even marry him. Lorelei will marry and have a baby with Luke. And different things like that. PLEASE PLEASE PLEASE COME BACK GILMORE GIRLS MOVIE OR SOMETHING. A reunion movie would be wonderful. Please let us know how Rory is doing. Let’s see Lorelei finally marry Luke.